This entry was first published on The Discomfort Zone and is reposted here with Dweep Chanana's permission. 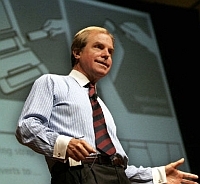 Nicholas Negroponte likes to point out that the OLPC project is "about learning, not about laptops." So the Harvard International Review and OLPC News take a close look at that value proposition. It is a point worth pondering, for the OLPC is drawing serious money, most famously with Libya committing USD 250 million for 1.2 million computers. Michael Diodato, writing for the HIR finds the OLPC technology disappointing - the much touted "mesh network" is unlikely to be useful in rural settings where people may not be within range of each other, and certainly not within range of an internet connection; the crank is unlikely to provide sufficient power for ordinary use, including use of the wireless network; and the restricted configuration requires proprietary software with limited applicability elsewhere. It is not technology, however, that kills the OLPC's value proposition - unfortunately for Negroponte, the HIR finds the OLPC short even on learning. Amongst the practical problems mentioned are the challenges of distributing - equitably - 1.2 million computers, and the cost - to families - of keeping the laptop in and their child out of work: "Considering the opportunity cost of keeping the laptop and the option selling it for approximately $100, the family is likely to choose the latter." There is one final nail in the OLPC coffin: the efficacy of learning with the OLPC - the basis of Negorponte's argument - has never been tested. Negroponte, himself, is a serious critic of any "pilot tests", claiming at the IADB that "to do a pilot project is ridiculous," and suggesting at TED 2006 that "this is not something you have to test, the days of pilot projects are over." That is a rather odd stand for a "scientist." As Robert Kozma points out in his piece, "empirical data are the sin qua non of both scientific research and engineering design." The OLPC is gaining serious traction now. 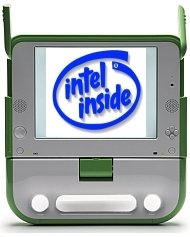 Recently, Intel joined the OLPC bandwagon, perhaps as a hedge against its own Classmate PC project - which has been shipping in volume, at prices of around USD 225, since March. And the laptop may finally ship this year, maybe as early as September. But for countries - particularly developing ones - to proceed without testing the "learning" hypothesis is irresponsible. 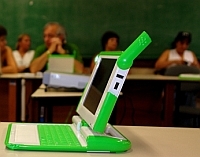 Countries that adopt OLPC without pilot testing are in effect conducting a nation-wide experiment. It is a roll of the dice. If the OLPC predictions are correct, the nation and its children win. On the other hand, if the grand national experiment fails, it is developing countries and their children that are least able to manage the consequences of this failure or recover from the expended costs. Alternatives: One Laptop Per Family? Basic Education? Neither of these criticisms is dogmatic, which makes them all the more credible. Technology is a good thing and its use in education to be encouraged. But how is that to be best achieved? And what is the goal of technology in education, anyway? The HIR, for instance, offers some alternative distribution models that tackle some of the social shortcomings of the OLPC. How about setting up OLPC cafés (shared laptops in communities), or giving laptops not to each child, but to each family? Fewer laptops would be needed [and] more money could be spent on individual laptops at the same total cost. ...It also reduces the chance of a family selling a laptop. If the entire family is benefiting from the machine, as opposed to just the children, then the family may decide to keep the machine. If software is designed that would enable the parents to use the laptop for their own purposes, perhaps for growing crops in an agricultural area, then the parents would have more of a reason to keep the machine. One simple solution is to invest money into traditional methods of education as opposed to those requiring technology. Although one of the main purposes of these advances is to allow all children to access the Internet, such a goal is not essential to learning...US$250 million being spent by Libya could instead buy millions of books or pay salaries for thousands of teachers. When looking at the use of technology in education, it is difficult to dispute that it is helpful. However, with only a limited amount of resources that can be devoted to a developing country, it is imperative these resources are distributed in the most efficient way possible. In the end, India was right to reject the OLPC. Whatever the real or imagined reasons for the rejection, the money is better spent elsewhere and the project is, after all "pedagogically suspect". "a crank is also included that would allow the laptop to be powered in rural places that do not have regular access to a power system." Not true. It's a pull-cord device. "For this system to work optimally, and for a connection to travel farthest, all computers must be on at all times, even when they are not being used." Not true. The XO's still act as relay stations when turned off. "Although this is speculative, it is good to observe the case of Windows- and Apple-based operating systems. Windows is infected by an abundance of viruses, while Apple has comparatively much fewer, mainly due to the fact that Apple has a much smaller marketing size." Not true. If it was, then Apache would be infected much more than IIS. Apple is more secure because it, like the X0, is based on a Unix-like operating system. "Due to the low technical specifications of the laptop, such as a lack of substantial RAM and hard drive space, common operating systems such as Windows and OS X are not capable of running on the laptop. In addition, these low specifications prevent usage by many common programs, such as Microsoft Office and the web browsers Internet Explorer and Mozilla Firefox. By preventing access to these programs, actual usage of the laptops will be limited to only a handful of programs specifically designed for the laptop. Although these will include an operating system and likely a web browser and word processor, its uses will be very significantly hindered." Not true. The author is apparently is unaware of the enormous amount of open source software out there. Has he been living in a cave the last ten years? "The US$250 million being spent by Libya could instead buy millions of books or pay salaries for thousands of teachers." The author is apparently unaware that the XO ebook mode means every student can have a complete set of textbooks. "Instead, the government could build wide area networks or increase the dissemination of wired broadband access. This would provide Internet access to all people with computers"
Except few people in the developing world can afford pc's, while many more can afford XO's. "Not every child may need a computer. Instead of giving laptops to every person, placing several computers every few miles throughout the country would be more efficient"
The problem with this is that, with so few computers, each person in the area gets only a few minutes of computer use a month. "A third answer would be to provide each family with a computer, as opposed to each child. Although such problems associated with the originally discussed laptop would remain, fewer laptops would be needed." Ah, at last, a workable idea. But remember, due to cost and power requirements, a standard pc or laptop won't work for this plan. It could be done only using XO's or one of XO imitations that will no doubt be produced. The author is obviously an ill-informed idiot. Which leads to the question as to why Dweep Chanana's thought it would lend strength to his argument to refer to him. I've found many of your observations inadequate, unconvincing and naive, but I've tried to keep the tone of the discussion here civil and polite; also I don't know you so I cannot assume that you as a person deserve the same set of qualifiers that your ideas may. I find your increasing number of rash comments, name-calling and insults less than welcome. If you are not capable of commenting on ideas and need to insult individuals you shouldn't speak. "With this laptop and its associated programs exist many problems, all of which are not clearly addressed. One major problem is that of distribution. Ideally, and in accordance with the program, all schoolchildren will receive the laptop, which would be paid for by the government. However, such a system of equity is nearly impossible. It is inevitable that some children will be favored, such as those with parents with more political influence or perhaps those that live in more urban areas." The author is apparently unaware that the politically connected people in the developing world have a lot more income and so can afford to buy regular laptops for their children. Also, they are a small minority compared to the general public, and so could not use many XO's in any case. Actually, classroom distribution is a good way to ensure equality of distribution, since 1) everyone in the class can see if someone didn't get a laptop 2) it is easy to see which classes got laptops and which didn't. Remember, transparency is the best insurance against corruption. As to the urban-rural problem, the author himself says "perhaps"
And don't similar problems apply to the solutions that he presents himself at the end of the article? I tend to agree with the first eduardo commenter. 1-Spread fear on a untested program. it seems that the pilots programs in brazil, nigeria, and uruguay are nonexistent. Althought they could provide more useful data in english, there are many videos interviewing the teachers and students in porto alegre, and the response seems excelent. 2-Repeat that the money should be spent in other serious stuff like teachers or books. It's an old argument that has been debated here long enough. The laptop is something to aid teachers and substitute books, not the contrary. 3-Say that the laptop cannot run office so it's not a real laptop. FUD. 4-Along with some loose phrases that show him that the writer is not very interested in discussing or informing himself, just generate some hits. Discussing the crank in 2007? Has he even read the WIKIPEDIA ARTICLE? I simply cannot understand how such a FUD article finds it's place in a well informed community as this one. Shame. "I find your increasing number of rash comments, name-calling and insults less than welcome." You're right. I should be more polite. So let me drop the last two sentences in my first post, and instead say, "I really don't find much of value in the HIR link." But putting aside my tone, what do you think of the content of my disagreements with the HIR link? "But putting aside my tone, what do you think of the content of my disagreements with the HIR link?" Yes. Please, Eduardo Villanueva Mansilla, could you say what exactly was "inadequate, unconvincing and naive"
I have an inquiring mind and I want to know. I completely agree with the first Eduardo. The comment of the second is basically shooting the messenger, instead of adressing the concerns. The original author goes on the wrong foot immediately by telling things about the XO that are glaring errors. There are office applications for the XO (eg, Abiword). Security of unix-like OS is a fundamental design feature. Mesh networks work if XOs are within one kilometer of each other, and they do work while the laptops are turned off (btw, as of this year, most people live in cities). Anyhow, in school the children will be close to each other. XOs are not tradable as they will be turned off. I consider thsi remark derogative. Poor parents will do almost anything to get their children educated. Also, the XOs will not go to war zones or famine regions. The crack was out almost immediately. There is a pull cord and many other options are being developed, all the way up to solar power. "For instance, instead of making the laptop run on only proprietary software, it could instead run on widely used software if the technical specifications increase." First of all, the author seems to have confused "proprietary" with "FLOSS". But the odd point is that everyone who actually KNOWS something about computer technology is raving mad about the XO technology, and only people who show to have no clue about computers are complaining. The XO is redefining laptop technology, and the author complains about not being able to run Microsoft Office, probaly the least efficient application (in space and CPU requirements) on the planet. And why replacing FREE (beer and speech) software with applications that each cost twice what the fully loaded XO costs will help cash strapped governments and poor children is beyond me. After the famous proof of the existence of God by Anselmus, we do know that not having proof that something exists is not relevant to whether it exists or not. The XO will be good or bad for education irrespective of whether we actually know that. Many comments, including this post, seem to think that the XO is bad to education BECAUSE we have not tested it. A test might be necessary before you buy, but is not necessary for the XO being good or bad. That's a very disappointing choice coming from you Wayan - surely you should judge the readers of your blog to know about XO a bit more by now ;). Although the article is full of errors the 'proprietary software' bit (whereas it's, in fact, the opposite i.e. Open Source) is just appalling. I normally have nothing against critical articles, but if they are misinforming people, they should not be published. We are not talking about opinions, we are talking about lies. i am a social worker and leader youth of muhammadiyah social movment in indonesia. can you help me any lap top for children at indonesia. please you come in indonesia see people here, they late in technologi information. Patrick, please re-read my comment and notice that I'm referring to Eduardo Montez style in general terms, not specifically about this particular discussion. Eduardo Montez: my opinion about this article is basically similar to yours. That's why I haven't said anything; if I agree with a commentator, and don't feel like reinforcing, congratulating or cheering him or her, I rather keep quiet. All, I published this post for its ideas on the XO not the Harvard Review's. Debating tech flaws instead of the post's educational themes is avoiding the tough questions. When someone asks "tough questions" using false facts and an incorrect premise then they are a troll. This kind of nonsense does not advance the discussion. "Libya could instead buy millions of books or pay salaries for thousands of teachers." Not exactly a new tough viewpoint. The tough question is why these countries have not yet done that. And where they are going to get the millions of teachers to do that. And indeed, "Everyone is entitled to his own opinions, but not his own facts". Most of the criticism is based on incorrect facts. The uninformed quipes to the mesh network, "proprietary" software/commercial bloathware, the way children will not learn anything from an internet cafe, and the crank are a dead givaway. "Debating tech flaws instead of the post's educational themes is avoiding the tough questions." At the end of my first post I addressed two of the author's implimentation plans. Oh, and note that in the last three paragraphs of the article he abandons education and focuses on IT promotion to the general population. Your timing is suspect. When everything written is on target but then the writer calls a spade a spade (as we are not supposed to do) you ignore the real content of the post and focus on the name calling it makes me think. It is nice to see and hear Marcello Tosati. Wireless Driver developer is not really a good description of the former Linux 2.4 maintainer. I have always thought that if he thinks this can be done, I think too. Now the nice thing about this short video is that the teachers have an opinion on most of the questions discussed on OLCPnews. Very informative. As if they read OLPCnews before and asked them all the questions. I must say, I don't think this video really strengthens the arguments discussed in the post up here. Especially the "doesn't work", "underpowered", and "no useful software" part seem weak. They did take the predicted road to teacher instruction. Also the question of those kids not becoming programmers is addressed. Patrick, you are entitled to your opinion. So now please let it rest; I said what I said and Eduardo Montez acknowledged it. That's the end.